—Michael R. Burch, "Epitaph for a Palestinian Child"
My hope for the future is to free Palestine. Living in Gaza is like living in prison. The borders are closed, no airport like other countries, wars, people dying. We want freedom like other countries. When I hear bombing I’ll be afraid. I really really wish for freedom. therefore we should have our eyes intent on beginnings. we will have to begin with the children. If you are unfamiliar with the real history of the Israeli/Palestinian conflict, or have been told that Israel is "only defending itself," please read Albert Einstein's 1948 letter to the New York Times, then click your browser's "back" button to return to this page. If you want to understand how the the theft of Palestinian land relates to Israel's new offensive against Gaza, known as Operation "Pillar of Defense" or "Pillar of Clouds," please click here Amud Annan "Pillar of Fire." If you want to hear the opinion of the former U.S. president and Nobel Peace Prize laureate who negotiated peace talks between Israel and Palestinians, please click here Jimmy Carter: "Israeli policy is to confiscate Palestinian territory." to live two artless years! 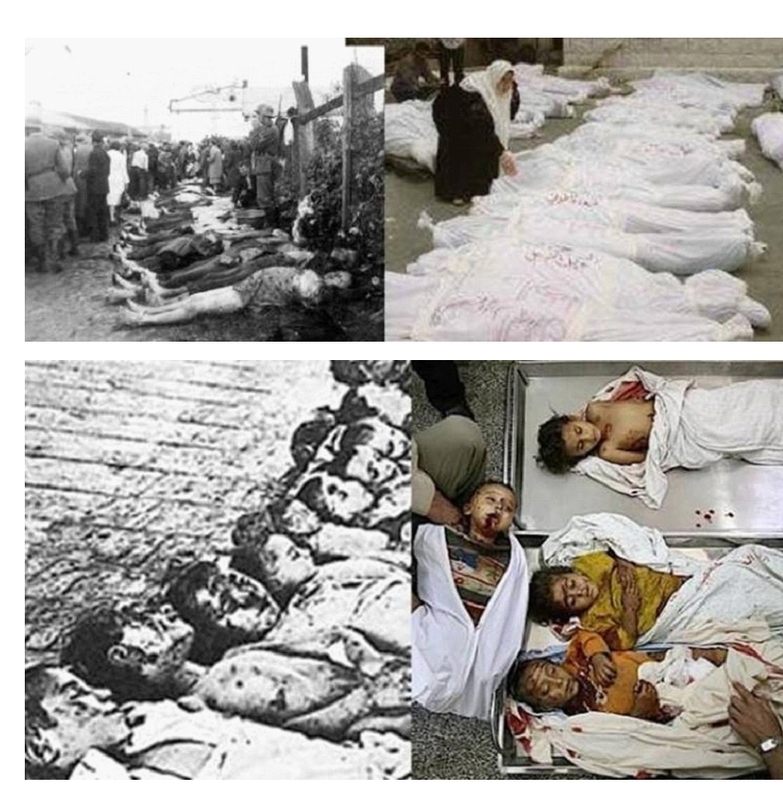 In the photos below, the pictures on the left are from the Jewish Shoah (Hebrew for "Catastrophe"), while the pictures on the right are from the Palestinian Nakba (Arabic for "Catastrophe"). 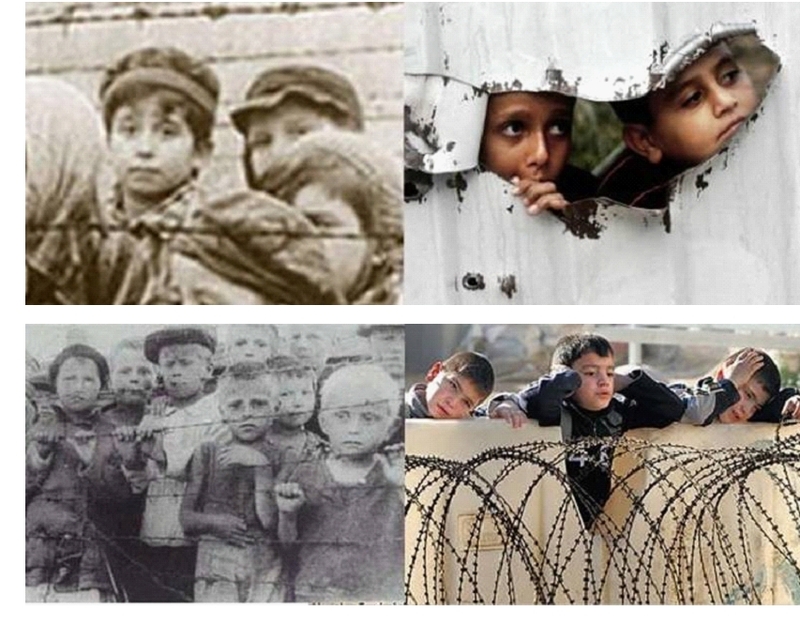 During the Holocaust, Germans made Jewish children a "special case" and you can see the results on the left. 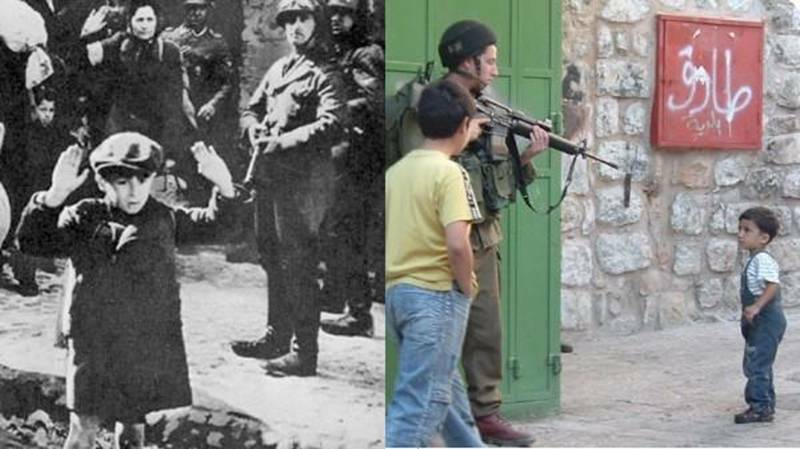 Now Israelis have made Palestinian children a "special case" and you can see the results on the right. Something is obviously, profoundly wrong when we see children being collectively punished for the "crime" of having been "born wrong." I had a dream of Jesus! Mama, his eyes were so kind! hissing "you're nothing," so blind! no way to love Israel and reject Palestine. 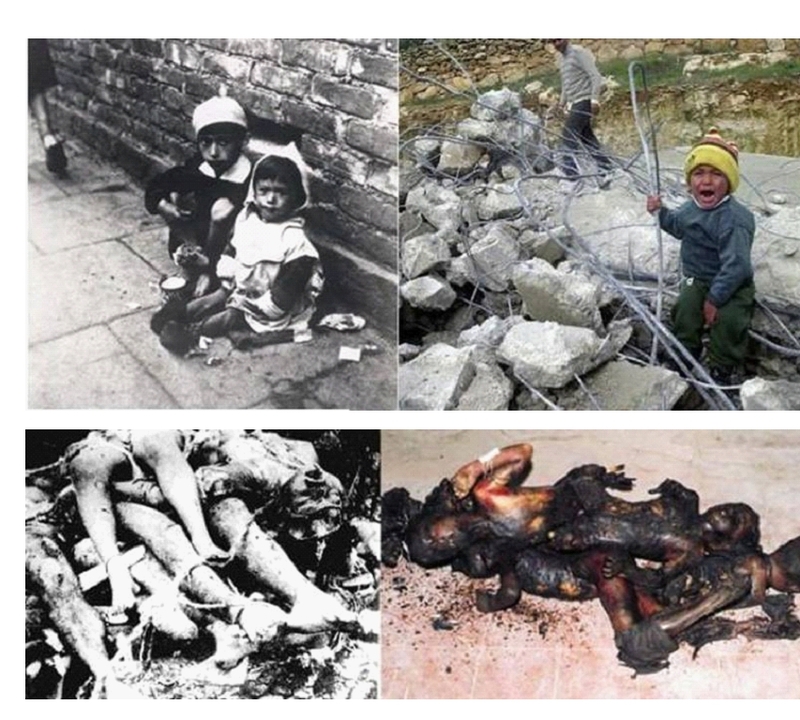 If you are a student, teacher, educator, peace activist or just someone who cares and wants to help, please read How Can We End Ethnic Cleansing and Genocide Forever? and do what you can to make the world a safer, happier place for children of all races and creeds. The poem below was translated from the Arabic of a small Palestinian girl around age 12 or 13, by a translator who has agreed to help provide us with the accounts of Palestinian children in their own words. The translator's comments appear after the poem. The translation is a bit "rough" in spots, perhaps because the girl was distraught and our translator couldn't tell exactly what she meant. Why tread on us after that? Translator's comments: "When I heard this speech I cried from the depths of my heart!" For God’s sake I am just fourteen! When I am president, I will be the president of Spain because I love Spain a lot. and control Israel and give it back to Palestine. I will buy limousines, Jeeps, phones, laptops and bodyguards. I will make everybody happy and I will let everybody call me the best president ever! I met two toddlers who were waiting for the borders to open, but would most likely die before they were able to get the treatment that could save their lives. 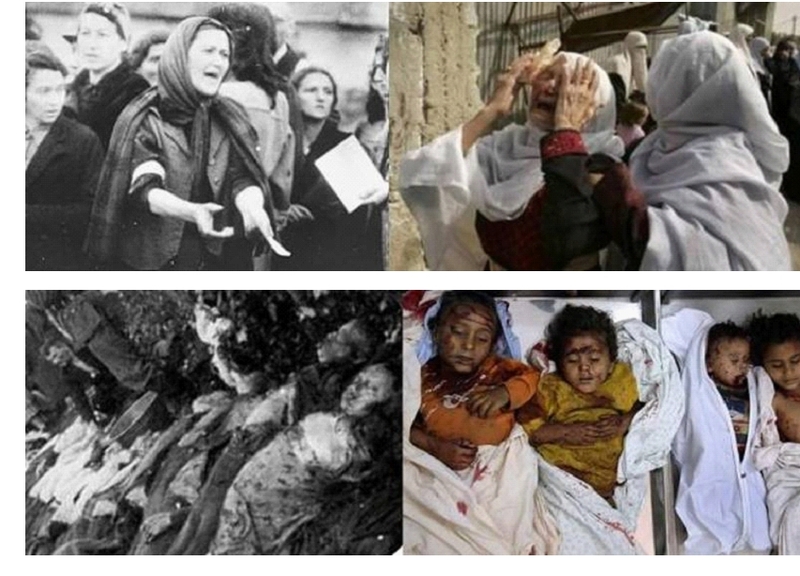 Two beautiful babies who had done nothing to offend anyone except to be born Palestinian. And for this, they are given a death sentence. I gave them a toy and prayed for a miracle. We can’t get basic things…I think that there is no future for us…I mean for Gaza’s people. There is no safe place we can go there, even we can’t communicate with our friends because networks are down. Our life is centered around those who have been killed. Imagine yourself with no one beside you, to take care of you or even to look after you…and the people around you are strangers…How long could you stand it? If the world stood with us we will not stand it any longer or anymore. But unfortunately there is no ”doings” just other people who are trying to help us by saying words, not more. They don’t do for us any good things. We are now better than before, at least we can go to school everyday instead of seeing others dying. I hope Gaza will change and be as the other countries…we just have to pray all the time! Living in Gaza is not always easy. When I came to Gaza, I did not believe what I saw. I saw buildings that were bombed, houses that were burned and people who were happy. I didn’t think people could be happy living like this. Now that I have been in Gaza for months, I realized that we don’t need to have the best stores, the best restaurants, or the best houses. As long as we have our friends and family, we can be happier than the people who have those things. While I am in Gaza, I have learned to make better use of my time. I used to think that when the power goes out it would be hard to do anything. You actually can have a fun game or talk to your cousins. I can’t say I hate Gaza because it is where I am from so I am happy here. I am proud of where I am from and happy to be here. Future – it’s a big word for me and I have a lot of dreams. One of my dreams for the future is that I want to be a journalist. Two years ago I decided to be a journalist because I saw that my friend was so happy with that work and I like to write and take photos and things like that. These days, I started to think about that idea. My friend is Egyptian and she traveled to China, India, Iraq – all those places, so I thought of being a journalist just like that; traveling, shopping, taking some photos and writing essays but I forgot that I live in Gaza and those things are impossible for us. I can’t travel at any time or write anything here. 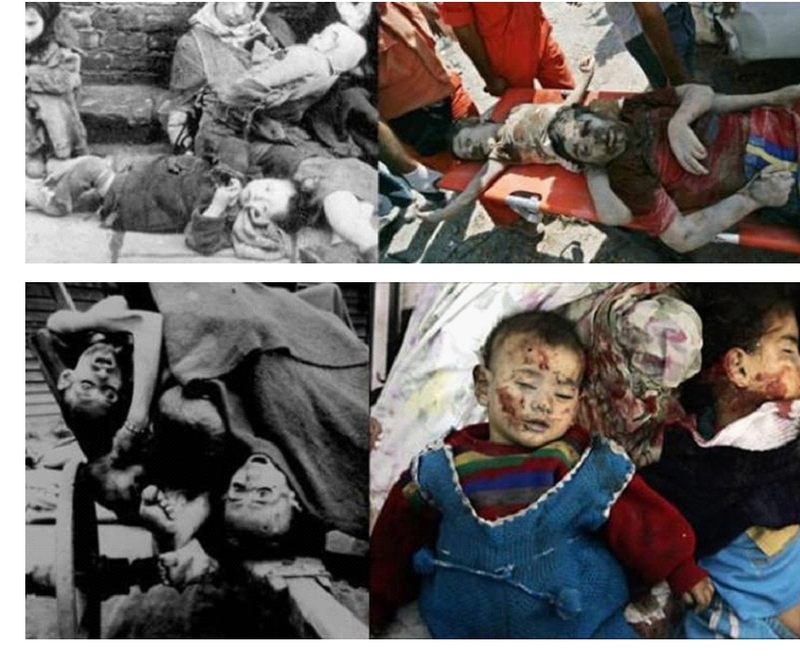 No one writes anything except about war and enemies (Israel) so my dream started to vanish. Now I don’t know what I want to be and have no dream. Gaza is a world of contradictions. Wide open blue skies, walls all around. the agony of adults who want to make something of their lives. As we made our way around the Gaza Strip, I saw so much devastation. to the pristine treeline, the beautiful buildings, grassy fields. All of which Gazans are denied. Every day Gazans are reminded of what is constantly being taken from them. The people so appreciated a visitor from outside. to come and share in a slice of life in Gaza. They were grateful that we came so we could understand what it’s like to be Palestinian. I love Gaza and I love the people there. I will continue to do all that I can to join hands with them and support them in their time of need. Living in Gaza is like living in a cage. We can’t travel, we can’t take our own opinion and we should always be ready for anything unexpected to happen, such as a bomb far or nearby, war or a problem anywhere. You could even be kidnapped for a political reason. In Gaza, each day that passes by, there should be 8 hours without electricity. But, whatever you hear about us...we are powerful, we are strong and we have brave people but we don’t have the minds to work on our case. We sometimes make ourselves happy just to run away from worries. It’s as making ourselves confident. In Gaza, the only thing stopping us from peace is that we should be on one side, not including the games of political parties. We also, in Gaza, share anything around the world. We are people the same as any country. I guess so…!!!! The things that we love in Gaza is our friends and family. It is the only thing that we are alive for!! In the future, I will make a factory for cars and I will make it in Gaza because Gaza doesn’t have a car factory. I will make a car company and I will sell them to Gaza’s people and I will give them to my dad and mom. I will give each of them two cars and to my brothers I will give them each two cars. My uncle will let me study with him and I will give him the latest model. I will bring a quad for myself. I want the quad now. The future will be nicer than we are now. I will bring to Gaza everything. I will let the people who are very sick go to the doctors in Egypt, Israel and London. They will become very happy because they were very tired. I will be the president of Egypt and I will bring new mobiles to Egypt and bikes and motors. I will bring construction and cars. and become a famous man and it could make you rich. Maybe you’d have companies, malls, cities like “City Stars”, hotels, restaurants and towers. This is the life of a business man. Maybe your children will live a good life if you’re a business man. I love this work. I might work in business when I will finish studying because my dad is a business man and I want to be like him. I wish when I will be, inshallah, I will make a business in a lot of countries, Europe, Americas and at the first Asia (Palestine). It is really nice work to work in. That is my opinion. Today one of my classes started making some artwork that will be displayed in a Palestinian Cultural event in Oregon, US. I told them to draw how they feel about living in Gaza. What do they see? What is a memory that keeps coming to mind? One very sweet, bright boy told me the story of one of his friends. The boy's father was arrested by the Israelis for something and he was killed. The father of his sister's friend was also arrested by the Israelis, this time for burning an Israeli flag at the end of the war. He was taken, murdered, then his body was wrapped in a blanket and delivered to the doorstep of his home. The ones who delivered the body knocked and walked away. The wife and daughter of the deceased man came to the door and found something wrapped in a blanket. They pulled the blanket back to find it was the father of this family. I could hardly breathe, imagining such a horror. Another boy told me that in the first day of the war, Israeli soldiers entered his home and broke everything. "Why did they break it? ", he asked. Of course, I had no answer. He went on to tell me that there were people being killed all around where he lived, including women and children, and that when the ambulances came, the soldiers would let them take out the dead bodies but not allow them to rescue the injured. We just can't imagine what these children have witnessed. These kids are in grade six now, so they were in grade four when all of that happened. Some of the kids weren't finished yet, so I told them they could finish next Sunday. One of my students asked if she could also write something for you so I told her she could. One of my girls called me over to her and told me quietly that the Israelis are planning to attack again but no one knows when. I told her I had heard that too. She said softly, "It makes me afraid". 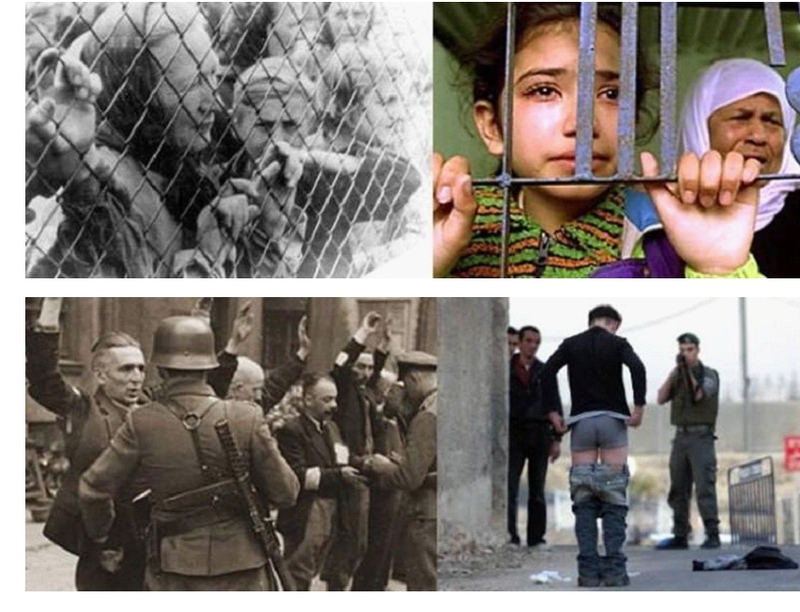 PLEASE impress upon people what these children have suffered and the ongoing psychological terrorism that continues. A few days ago, Israel held "mock airstrikes" during our first period. Last night they bombed somewhere for real. They are always bombing and you can tell when they are close because many of the younger children show up to school the next day looking completely haggard and worn out. The dark circles around their eyes show their lack of sleep. 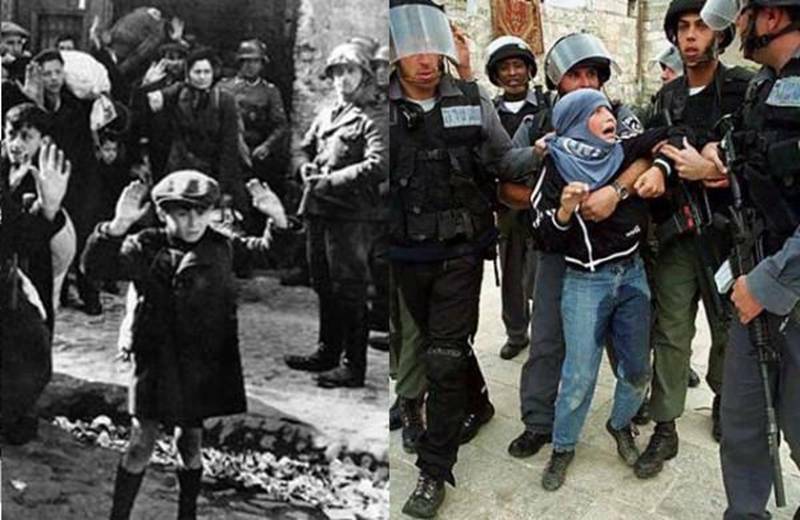 It is barbaric for Israel to continue to terrorize these children. I woke up at four this morning and didn't know why until I got to school today and learned about last night's bombing. It was at four am. I must have been sleeping deeply enough not to hear it but not so deeply that I was able to sleep through it. 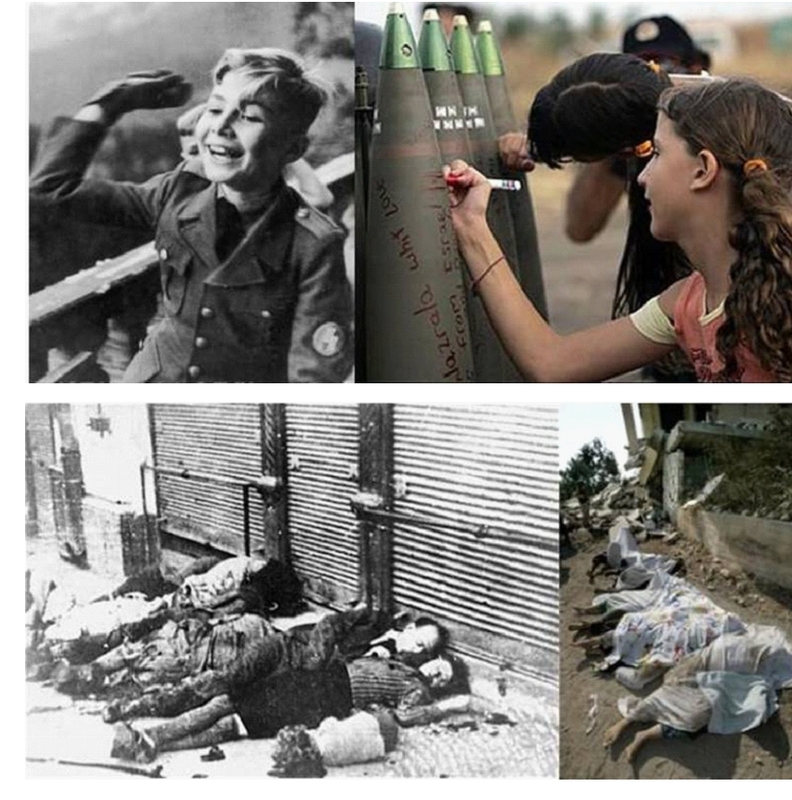 The children are afraid because the images of the last war, of all the death and fear, are still so fresh in their minds. Their Teacher on "Gaza's Real Treasures"
It's a new school year and Gaza has a new teacher. I have the awesome privilege of feeding young minds from kindergarten to grade twelve at the American International School in Gaza. During my first class with the grade six students, I encouraged the children to introduce themselves to me. I wanted them to tell me a little about themselves. Child after child gave me their name and a few personal details as we all got to know each other a little better. Every child is beautiful, bright and angelic in their own way. Finally, it was time for the girls to my left to introduce themselves to me. The first girl, with a thick blonde ponytail, bright hazel eyes and a gorgeous smile asked in her sweet voice, "Can I talk about the war?" I was caught off guard, not expecting such words to come out of such an innocent face. I paused to catch my breath, not wanting these children to know that tears were almost filling my eyes. I softly said, "Yes, if you want to." She proceeded to tell me about the first day of bombing and how scary it was for her family to have bombs dropping all around her home. She told me, in vivid detail, where each member of her family was, how frantically her mother was trying to locate all of her children. She told me how terrified she was when her home was filled with smoke so no one could find each other, how they all called out for each other, hoping that everyone was alright. I held my breath as I listened to her. This innocent child is the same age as my youngest son. As I heard her story, I thought of how I would feel if my own child was forced to live through such a nightmare. My mind was blank. She continued her story for the next few minutes, taking me through every step of that first day, letting me relive it with her and suddenly she said, "And then it was over", and her story ended. I could breathe again. I was so grateful that this is now her version of the story. In spite of the detailed horror of that first day, the next thing that came to mind was "and then it was over". I am truly and deeply blessed to share in the lives of some of Gaza's children. I hope I can give them something back to help them as they look forward in their young lives. They are bright, intelligent and beautiful inside and out and I hope and pray that we can find the way to give them the very best. Dare to dream, to believe, to succeed! I wanted to comment about my trip to Gaza. 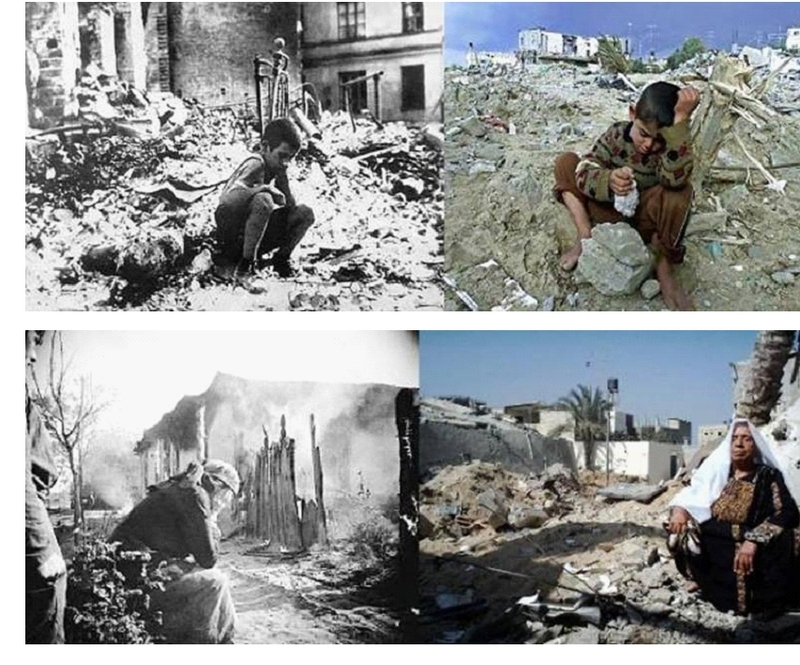 Gaza is a place of profound contradictions. There is remarkable beauty and heart-crushing agony. I learned from Sohaila Terazi, the director of the Ahli Arab Hospital, a Christian hospital, that they are seeing at least 10 burn cases a day, that is, children being burnt. Why? Because the closure [the blockade of Gaza by the Israeli military] is cutting off the necessary supply of cooking gas, leaving residents to resort to other fuels to cook in their homes. People are using wood, and even gasoline, to cook with and as a result, hundreds of children every month are being rushed to the hospital to be treated for burns. Another, more subtle effect of the situation in Gaza is on the day that PA salaries are deposited into the accounts of former PA employees, the line ups at the bank are literally in the 100s, all hoping the bank will not run out of cash before everyone is served. ATM cards in Gaza are not like we have here, where you can use them at every bank. If your ATM is not working, as was the case with one, then you have no choice but to get in the long line during banking hours to withdraw any money. The closure means that the motherboard required to replace the broken one in the ATM is coming from Ramallah, but the borders are closed ... so it’s anybody’s guess just when the one piece of equipment will arrive. The siege grinds the soul and sanity of Gazans. There is nothing to do, no place to go and no feeling of security. The restrictions on the amount of fuel that goes into Gaza means that the electrical power plant cannot run at full capacity, thereby being unable to serve all of Gaza at once, which results in revolving blackouts. It’s summer now and it’s hot, but you may or may not be able to even have a fan on to give a little relief. Gazans are denied even that. What is the effect of this soul-sapping deprivation? Patience can be a little thin, morale a little low, tempers can run close to the surface. In this land of some of the most gracious people I have ever encountered, this land of immeasurable hospitality, the agony and frustration is often hidden by a smile of resignation and a shrug. ”What can we do?” I heard time and time again. This is no way to live. When a person has to deal with limitations brought about by their own choices, they can take heart in the knowledge that even as they got themselves into a jam, so they can also get themselves out. No so for Palestinians. They’re in a jam, alright, but there is nothing they can do to remedy it. I got a small, very small taste of what this is like. On the day I was supposed to leave, Friday June 12, to catch my plane out of Cairo the next morning, I was unable to leave. Egypt controls the Rafah border but they do it in cooperation with Israel. I was told that I could not go through the border that day. I was told the border would also be closed on Saturday and Sunday so I should try again on Monday. Try again? On Monday morning, I showed up again, this time with a friend, Wessam. She is a local news anchor who had arranged to go to a training program for work in Dubai. Her company had made all of her arrangements. As Wessam and I sat in the hot desert sun and waited, we passed the time talking, watching people and wondering what the outcome of our day would be. Eventually we got the news that I would be allowed to leave, but not my friend. The reason? Again, there was no reason for her to be denied access, except for the fact that she is Palestinian. The four of us, Wessam and I and our husbands, had spent all morning at the border but three of them had no choice but to go back. Wessam still has not been allowed to attend her training program. To be faced with walls, fences and razor wire on every side eats away at your sanity day after day. There is always the sound of “boom boom” as we called it, especially at night. I learned to differentiate between the boom boom being on the eastern border or at sea, targeting fishermen. I learned to recognize tank fire when I heard it. And I was only there for two weeks. Palestinians are human – just like us. How long could we tolerate such treatment? How long would we tolerate being imprisoned, starved, robbed, poisoned, bombed, burned and mocked? Would we not expect to reach a saturation point of frustration? I have no doubt I would. Palestinians in Gaza and the West Bank may not be able to change what’s going on around them. They are powerless to influence the politics around them, but we can do something! Support those who are suffering in Gaza, let them know they are not alone. Let them that what happens is not in our name. Love, true lasting love straight from God’s own heart is what is needed to bring real peace to this wounded and troubled region. Please take action now and help save lives before it’s too late. So many have been lost while waiting. In my conversation with Dr. Mustafa of the Al Nasser Children’s hospital I learned that children are literally dying because of the closures imposed on them. Doctors can’t bring in necessary diagnostic supplies to accurately assess patients and neither can they evacuate critically ill patients out to other hospitals for treatment. Gaza is a world of contradictions. Beautiful people, ugly confinement. Wide open blue skies, walls all around. Laughter of children, agony of adults who want to make something of their lives. As we made our way around the Gaza Strip, I saw so much devastation. There were broken buildings, broken roads, and broken lives – but if you look further into the distance, you could see across the border and into Israel, to the pristine treeline, the beautiful buildings, grassy fields. All of which Gazans are denied. I can’t wait to go back. The people so appreciated a visitor from outside. They were excited and welcoming that people would actually brave the borders and the bombing to come and sit with them, to come and share in a slice of life in Gaza. They were grateful that we came so we could understand what it’s like to be Palestinian. I love Gaza and I love the people there. I will continue to do all that I can to join hands with them and support them in their time of need. Does Jesus Love Me, a Palestinian Child? by each child who's a Jew. Are his feet racist clay? Is your Jesus a heel? and expired at your door?